The cheetah can go from 0 to 45 MPH in 2.5 seconds. 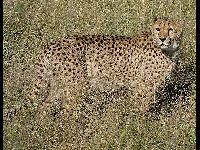 The Cheetah is the fastest land mammal. 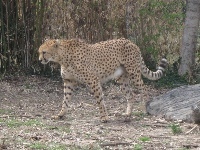 Cheetahs live in Africa and parts of Asia. Cheetahs have great eye sight, which helps them hunt. Cheetahs can only run quickly in short bursts. Cheetahs have semi-retractable claws, a trait found in only three other cats. 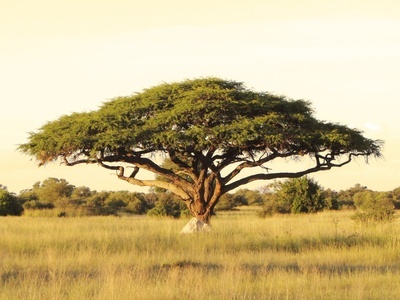 Cheetahs like to live in open areas like praries or savannahs, but they can also be found in forests and mountains. 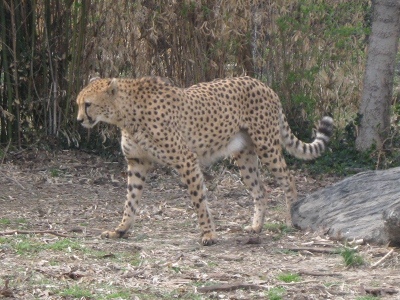 Because they're smaller than most predators, cheetahs often lose thier meals to other animals. Throughout history, cheetahs have often been tamed and used for hunting. 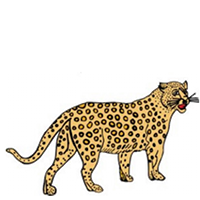 Cheetahs lived in India for a very long time before going extinct there in the 1940s. The flexing and snaping back of a Cheetah's spine helps it gain speed. 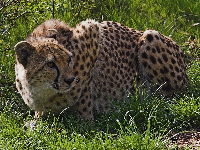 Cheetahs often eat their capture prey in a hurry before larger animals and scavengers arrive.